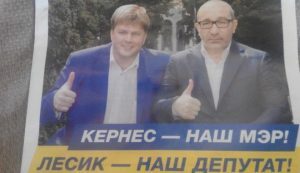 On May 17 Gennady Kernes deprived the mandate of deputy of Kharkiv City Council Andrey Lesik with disgrace because of an incident on May 9 when he provoked a confrontation wearing St. George Ribbon, informs Newsonline. 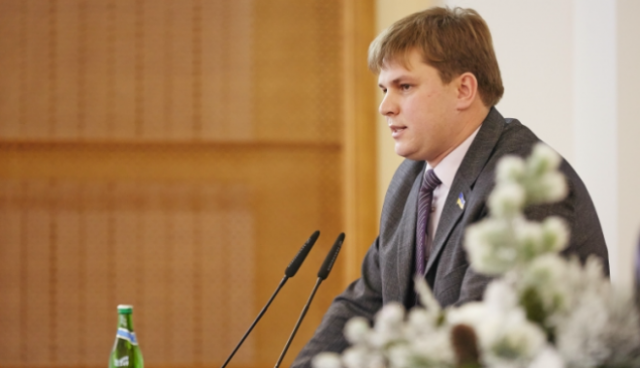 In connection with the provocation of the conflict on May 9 in the Memorial of Glory in Kharkiv deputies voted for the exclusion Lesik from the electoral list. This decision was supported by 63 deputies, and only one voted against. The governor of the Kharkiv region Igor Rainin commented on the decision of the City Council Deputies of deprivation of Lesik’s mandate. According to the governor, he fully supports the decision. “As a citizen of Ukraine I’m convinced – there is no place in the government for pro-Russian provocateurs and traitors of our country. I think the Security Service of Ukraine should analyze and give a legal assessment of his actions,” said Rainin. As Newsroom reports (RU), “exiled” deputy Andrey Lesik decided to sue the City Council because of his deprivation of mandate. He wrote this on his Facebook page. He said that on May 18 will be a meeting of the municipal electoral commission, where the procedure of deprivation of his deputy mandate will continue. But Lesik considers such action unlawful. “Please note. The commission has no legal grounds. I did not write the statement. On May 17 I filed a lawsuit on wrongdoing of City Council. The Commission has no legal basis for the consideration of the matter until the court’s decision. The Commission notified in writing that the case is in court,” he wrote.